The Weekend is over *womp womp* I am happy to report that I have been going to the gym in anticipation of summer and I've been scrambling because this hot weather is creeping up on us! In fact, yesterday it hit 80 degrees here in San Diego and I was like "wait... I'm not ready!" Since I wasn't ready to go splish splash in the pool, I decided to Springify (if that's a word) my blue colored jeans by adding a floral light-weight scarf and this very comfy T-shirt to enjoy my Sunday afternoon. What are you doing in anticipation for spring/summer?? That scarf is so pretty! I love the print on it. I've been in the market for a floral scarf and this one would be perfect. very nice outfit! 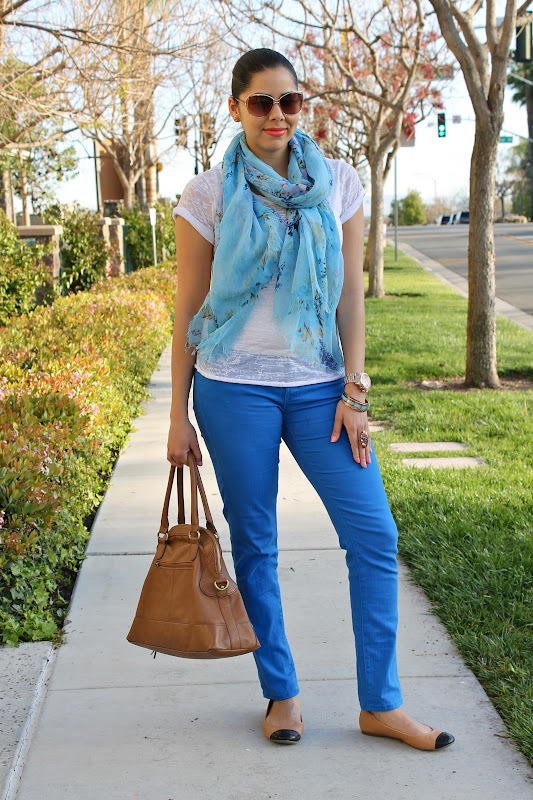 love the scarf and fab bag! I can't wait until it's warmer around here so I can use a pink nail polish like yours! love that you wore beige flats with the blue outfit, it's good contrast! Cute scarf! beautiful pictures! love the pants! I have to hit the gym too! lol Nice jeans, love the color! you look adorable Pau!! Love the springy look I can def tell you are ready. Well I was also surprised that it got warm so quick here where I live too (in AZ) LOL. Looking gorgeous in blue! Love your style! i love blue on you! such a cute look! i love the outfit!! and i love the texture of the teee! so cool! Google friend will soon be off , so would you like follow each other through Bloglovin? I can't believe those shoes are old navy! they are aaaamazingggg!!! 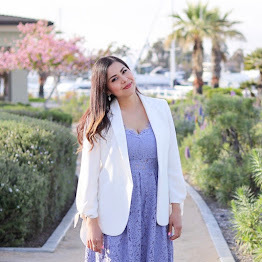 following you on bloglovin now! i don't know why I didn't before! u know I love ur blog hun!